Manager allows administrative users to moderate and manage the status of all reports shared with their group. Manager is a web based application available to administrative account holders. The easy to use management system allows members of groups to track their progress in addressing and responding to reports submitted by members of their organization(s) behind the scenes. Manager provides a single activity feed that mirrors your organizational feed in the Community. You can mark reports as “open”, “action needed” or “in progress”. Setting these flags in Manager allows you to filter by date and a specified status in order to keep track of where reports stand. It’s important to note that these flags are internal to administrative account holders for your organization and will not show up in the community. The user who submitted the report will not receive a notification until you choose to "take action" and close the report. Clicking on any of the other elements such as comments, profile pictures, or the take action button, will open the relevant community content in a new tab. If an organization has more than one administrative account holder, each user will be directed to the same Manager page. 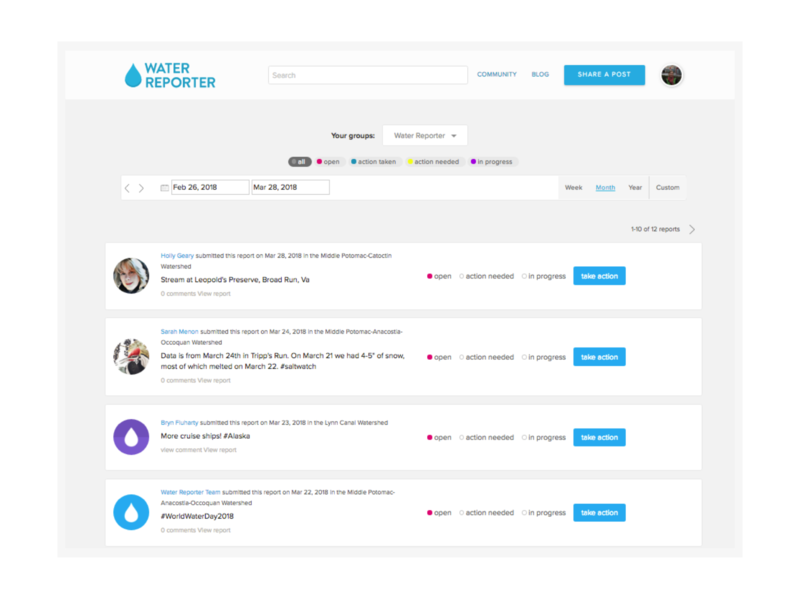 This means that multiple people can manage the status of all reports in real time through Water Reporter. While you can still download all of the reports if needed, we hope Tugboat will keep everyone more apprised and up to date on activities underway.